Ever wished your Mustang was a Roush? It can be, with a Roush supercharger. Along with it's fantastic factory warranty tuner cars, Roush also sells the pieces you need to turn your Mustang into a genuine Roush Mustang. On the other hand, if you'd like to make your own stamp on the Ford Mustang world, you can still have that performance advantage of a Roush supercharger. The great thing about getting your supercharger kit from Roush, is that you know it's designed to fit right and will not turn it into a hand grenade motor. If you've never heard the term before, it means an engine that's built for ultimate performance, but also has a tendency to explode! What we do like, is a solid performance gain with reliability. and this is a great combination to get just that. Here's what's included in an aftermarket Roush Supercharger kit. Unlike the old days, a modern engine is blessed (or cursed) with a huge amount of electronic controls, so to make any system perform flawlessly with a bolt on supercharger kit, there needs to be a calibration package for the engine computer. Other components include a new induction system, supercharger,intercooler,crank pulley,wiring,and depending on the application and performance level, larger injectors and throttle body. 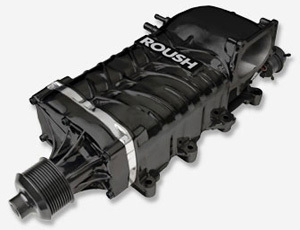 Roush manufactures several blower kits for all of the new Mustang incarnations so far, including the 2005, 2006, 2007, 2008, 2009 and 2010 Mustang 4.6 liter V8's. 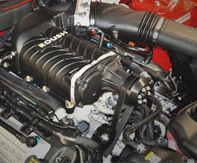 There's even a brand new supercharger for the 2011 Mustang Coyote Engine with it's 5.0 liter supercar motor. Follow the link for the full story on the 2011 Mustang Roush supercharger kit. Single and double belt pulley arrangements are available, and it only makes sense that the double belt will be the more robust combination. Phased R2300 ROUSH Mustang Superchargers. These units are capable of boosting performance of the 4.6 liter V8 to between 475 and 625 horsepower on the 2005 to 2010 Mustang GT. ROUSH M90 Mustang Superchargers. These supercharger packages, while still much more powerful than stock, are designed to increase horsepower up to 435 horsepower with 400 lbs of torque. They're also considerably less expensive than the higher output R2300's. Note: the above horsepower output figures are for the 4.6 liter V8, not the Mustang Coyote Engine. See the 2011 Mustang link above for the new 5.0 Coyote engine. If you're buying a complete short block, you will get a full 3 year 36,000 mile warranty. If you buy the kit only, they come with a 90 day warranty. The biggest advantage of a supercharger, is that all of the parts affect the intake part of the engine. This means, no cutting and fabricating of exhaust systems to make the turbo boost get to the intake system and not having to find a way to get the spent exhaust gasses back out to the cats and mufflers. The disadvantage, is that it's harder to tweak horsepower levels, because adding more boost, means changing crankshaft or blower pulleys to increase or decrease boost. A turbo, on the other hand, really only needs to have it's wastegate adjusted to bleed off more or less boost. It allows the driver to say, dial in a street tune for daily driving and dial up a bunch more boost for weekend drag racing. However, we again are looking at the potential of a hand grenade motor, without the right engine building underneath. For an in depth look at the advantages and disadvantages, as well as how each system works, you'll find the full scoop in Section 3, of the Mustang Performance Parts guide.